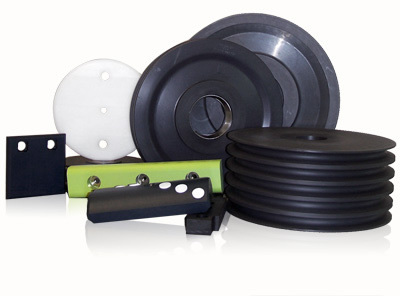 The heavy equipment industry presents nearly unlimited opportunities for plastic bearing and wear applications. Over the last several decades, plastics have been used over conventional materials with increasing frequency in order to reduce weight, reduce wear on mating components, eliminate the need for external lubrication and extend component life in abrasive and corrosive environments. Nylon based materials are ideal for wear resistance and heavy load applications, while UHMW works well for low load with slide applications. Each material is available in a variety of colors and filled formulations, including ceramics and lubricants, to fortify the desired performance characteristics. Our unique combination of manufacturing expertise, broad equipment capabilities and materials knowledge can be a valuable asset in both your new product design and MRO efforts. LVP currently manufacturers thousands of different sheave and wear pad designs for many of the world’s leading heavy equipment manufacturers. Our depth of experience in this industry is truly without rival! Or call us at 1-800-354-5344 to discuss your application.